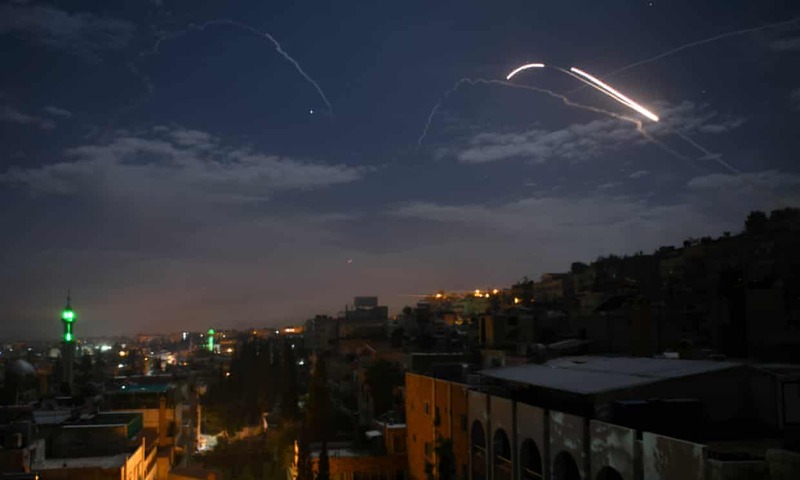 Israel has struck several targets in Syria as part of its increasingly open assault on Iran’s presence in the country, shaking the night sky over Damascus with an hour of loud explosions in a second consecutive night of military action. Damascus did not say what damage or casualties resulted from the strikes, but a war monitor said 11 people were killed, while Syria’s ally Russia said four Syrian soldiers died. The threat of direct confrontation between Israel and Iran has long simmered in Syria, where the Iranian military built a presence early in the civil war to help Bashar al-Assad fight Sunni Muslim rebels seeking to oust him. Israel, regarding Iran as most dangerous enemy, has repeatedly attacked Iranian targets in Syria and those of allied militia, including Lebanon’s Hezbollah, without claiming responsibility for the attacks. But with an election approaching, and with the US vowing more action on Iran, Israel’s government has lifted the lid on strikes that it would previously have preferred to keep quiet, and has also taken a tougher stance towards Hezbollah on the border with Lebanon. It blamed Iran for a rocket attack on Sunday. In Tehran, the air force chief, Brig Gen Aziz Nasirzadeh, said Iran was “fully ready and impatient to confront the Zionist regime and eliminate it from the Earth”, according to the Young Journalists Club, a website supervised by Iranian state television. Assad has said Iranian forces are welcome to stay in Syria after years of military victories brought most of the country back under his control, though two large enclaves are still held by other forces. His other main ally, Russia, worried about the consequences of Israeli strikes on the wider pursuit of a war that is entering its ninth year, has provided Syria with air defence systems. The Israeli prime minister, Benjamin Netanyahu, who is hoping to win a fifth term in elections on 9 April, last week told his cabinet Israel had carried out “hundreds” of attacks over recent years to curtail Iran and Hezbollah. “We have a permanent policy, to strike at the Iranian entrenchment in Syria and hurt whoever tries to hurt us,” he said on Sunday. In a highly publicised operation last month, the Israeli military uncovered and destroyed cross-border tunnels from Lebanon that it said were dug by Hezbollah to launch attacks during any future war between them. The US secretary of state, Mike Pompeo, has vowed to expel “every last Iranian boot” from Syria and a senior US official in Lebanon last week criticised Hezbollah over the tunnels. Israel last fought a war with Hezbollah, on Lebanese soil, in 2006. It fears Hezbollah has used its role fighting alongside Iran and Assad in Syria to bolster its military capabilities, including developing an arsenal of rockets aimed at Israel. Tensions have also risen with Israel’s construction of a frontier barrier that Lebanon says passes through its territory along the contested border. The Israeli military said its fighter jets had attacked Iranian targets early on Monday, including munitions stores, a position in the Damascus International airport, an intelligence site and a military training camp. Its jets targeted Syrian defence batteries after coming under fire, the Israeli military said. Russia said four Syrian soldiers were killed and six wounded. The Syrian Observatory for Human Rights, a UK-based war monitor, said 11 people had been killed. Russian-supplied Syrian air defences had destroyed more than 30 cruise missiles and guided bombs, Russia’s defence ministry said, according to the RIA news agency. Syrian state media, citing a military source, said the country had endured an intense attack through consecutive waves of guided missiles but had destroyed most “hostile targets”. Israel’s target was the Iranian Quds Force, a special unit in charge of the Islamic Revolutionary Guards Corps overseas operations, the Israeli military said. It followed a previous night of cross-border fire, which Israel said began when Iranian troops fired an Iranian-made surface-to-surface missile from an area near Damascus at a packed ski resort in the Israeli-occupied Golan Heights. Iran has yet to respond to the accusation. The Israeli military spokesman Lt Col Jonathan Conricus said the area it was fired from was “an area we were promised the Iranians would not be present in”, in an apparent allusion to Russian reassurances to Israel. Syria said it was Israel that had attacked and its own air defences that had repelled the assault.